Here’s a few helpful hints to help you get to know the ins and outs of YourCloudTelco Invoice/Statements. YourCloudTelco has been designed as a pre-pay and post-pay service, so you can choose how to bill your customers. YourCloudTelco is set up with the option to have all your accounts configured to be pre-paid. What this means for you is there is no need for you to issue invoices for payment as each account pays for services up front. That’s a bonus for you as you have no outstanding invoices, no debt collection and you can reduce your accounts receivables team. Each month, on the bill anniversary date, a Tax Invoice/Statement is issued to the Billing Contact (or the Main Contact if none is entered) on your customers’ account. For pre-pay services this is a Statement not an Invoice. The details contained within the statement show a summary of the activity on the account and the services that have already been debited from the credit allowance added to the account. YourCloudTelco is set up with the option to have all your accounts configured to be post-paid. If you are setting up your customer accounts to be post-paid you will need to issue invoices for payment and you will set the terms for these. For post-pay services this is an Invoice not a Statement. The details contained within the invoice show a summary of the activity on the account for the month including services used and payment made during the month. Your own YourCloudTelco account is pre-pay only and will be charged for all account activity as services are used. 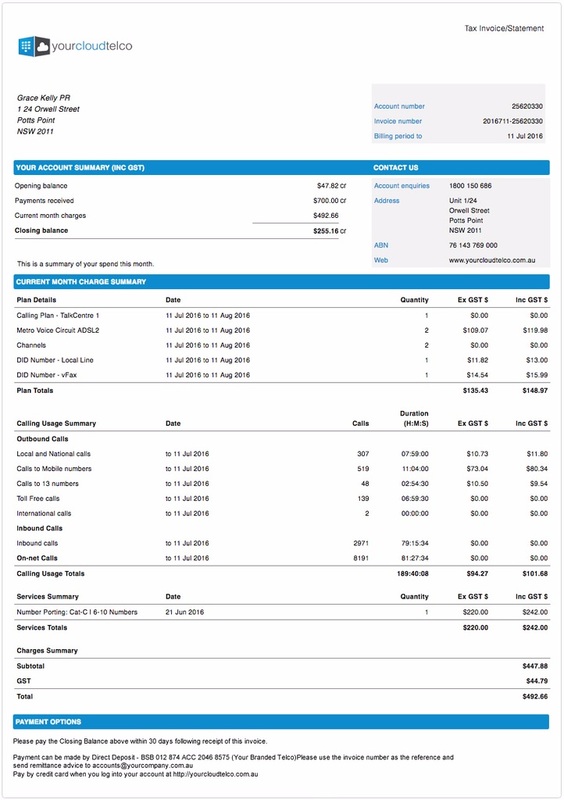 Here’s an overview of an Invoice/Statement produced by YourCloudTelco. This is used for both pre and post pay accounts. To see the detail of the account activity for the month, you, or the customer will need to login to the customer’s account and access this. Here's a summary of your bill including the Closing balance which is the amount owing if the customer is on a post-pay service. Payments made to the account during the month are shown here as a credit, eg "$700 cr"
Plan Details shows the fixed monthly charges that are on the account. If a plan has been updated during the month, pro-rata charges will be shown here also. Call Usage Summary shows the calling activity made on the account. Notice that all on-net calls are charged at $0.00. This will also show Call Collection for 1300/1800 numbers. Services Summary shows any billing items that have been charged to the account during the month, eg porting fees, number set up, etc. This is also where manual credits are applied to the account. Payment Options is where you can specify your Post-Pay invoice terms. You can send us these details or updates to these at any time and we will have these displayed.